Ok, I have to be honest. It is getting cold this time of year. Going to my local campground to shower is a chilly proposition. Some nights I end up working so late I don't get there on time before the gates are closed. Nothing is worse than having no opportunity for a nice hot shower after a long day. I have been kicking around lots of ways to shower at the Shouse considering I don't have a real bathroom yet and I don't have a well pump. Whatever system I devise must take into account water conservation since all water must be brought home from outside sources. Additionally, the space where I have my "bathroom" right now is not insulated. Getting naked and wet in an un-insulated space in the dead of winter...ugh, you get it. I used to use a solar shower like this one to shower during the summer, but it was awkward and did not hold up very well. Eventually I turned to my local lake to shower, which has worked out really well. However, temps are starting to drop and, let's face it, I would much rather shower at home. 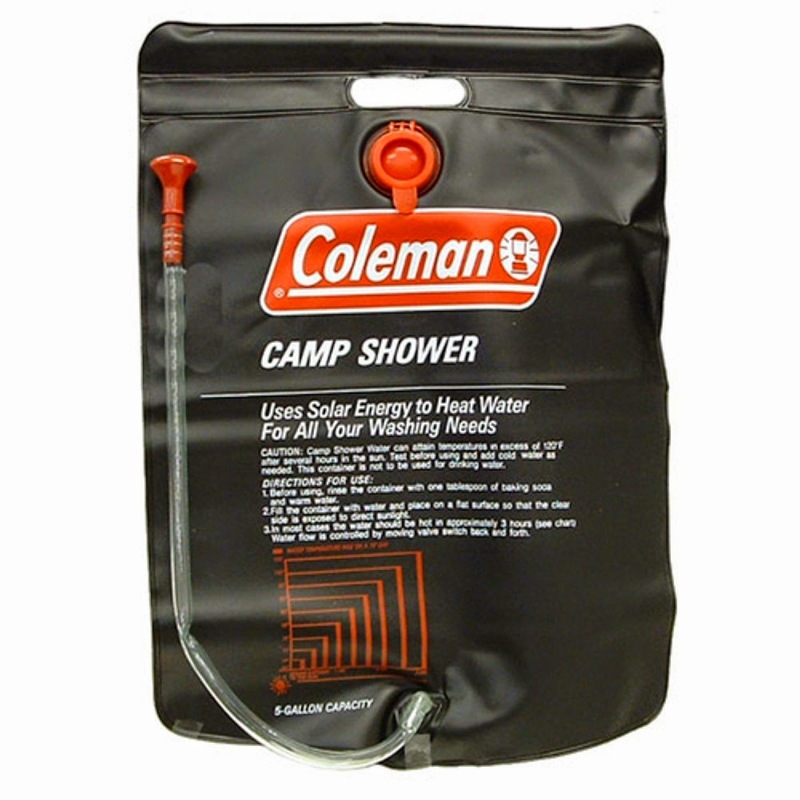 I spent some time researching different styles of camp showers and I found this magnificent item. For just $40 I have a steady flow of water! It is even rechargeable via USB. More about that later. Meanwhile, I needed a bathtub to get me by. Prior to finding my fabulous soaker bathtub for my future bathroom, I had dreamed of using a galvanized stock tank just as I had in my cabin I had years ago. I was lucky to find a galvanized 2 x 2 x 4 stock tank for $69.99 at my local Atwoods Farm Store. It is lightweight enough to transport and just the right size to get me by as a small bathtub/shower. Next, I bought the largest diameter Hula Hoop I could find at my local discount store. The one I got measures 36" in diameter. Using screws with large, flat heads, I screwed the Hula Hoop to the rafters. Next, I added two clear shower liners. I was lucky that they were the perfect length and I didn't need to cut them. I slid the stock tank under the shower curtains and heated up a bucket of water by adding a kettle of boiling water to room temperature water. I hung up the shower head using the hook that came with it. I was really beginning to anticipate a nice hot shower at home! I pulled the shower curtains into the tub with me and put the bucket of hot water in as well. I dropped the pump portion of the portable shower head into the hot water bucket and proceeded to take a glorious shower. I have really long hair and it takes a bit to wash it. 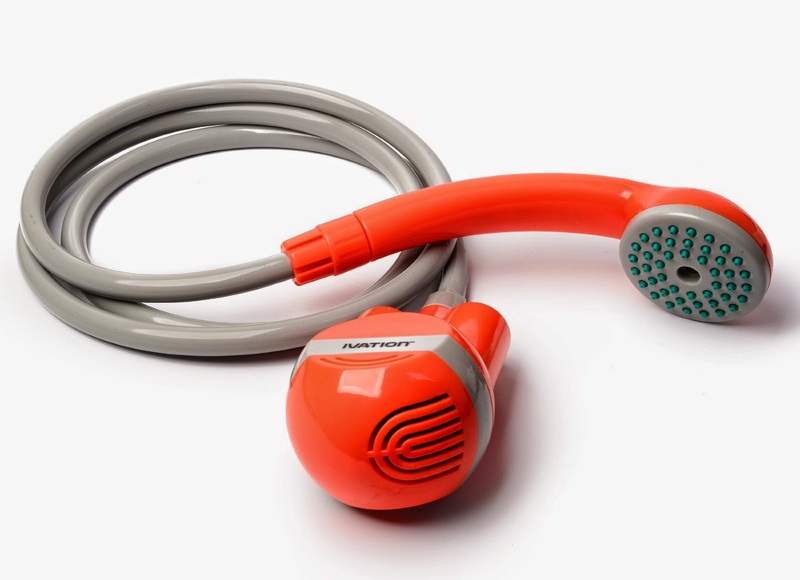 To conserve water I wet my hair first, turn off the pump, soap up, shampoo up, and then turn the pump back on to rinse. I was surprised the first time I used the shower there was no draft. Considering how cold it can be in a building that is not insulated, the double curtains overlapping and the magnets in the bottom helped keep the curtains in place and the drafts out. Air is still able to circulate above, but the annoying chill I was anticipating just was not there. 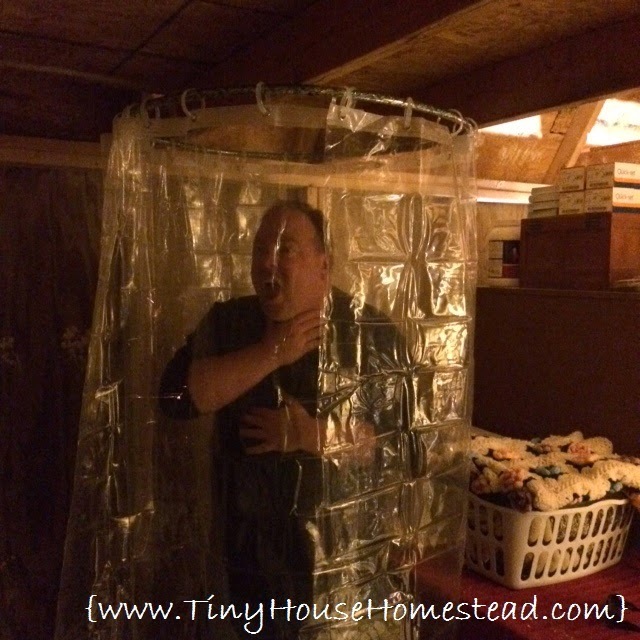 This is the best dry cabin shower I have come up with to date. I love that it is USB rechargeable. I make sure to drain it completely and allow it some time to dry before plugging it in. One charge will keep the shower running for about an hour. Not too shabby at all! I am even contemplating a larger bucket for a longer shower, but it really isn't necessary, just a luxury. I have a plan to make this a working bathtub with drain, but that will be shown in a later post. For now I am pleased with the shower. What do you think? Not bad, eh? I tell ya, it may not look like much, but finally being able to shower at home is a great feeling! I love this post. My question is, how did you drain the tub?